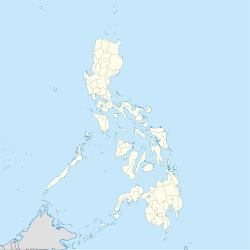 Cabadbaran, officially the City of Cabadbaran, (Cebuano: Dakbayan sa Cabadbaran), or simply known as Cabadbaran City, is a 6th class city and capital of the province of Agusan del Norte, Philippines. According to the 2015 census, it has a population of 73,639 people. Panorama view of Puting Bato, Skyline of Cabadbaran, and Cabadbaran Plaza. Founded in 1894, the city rose from its Spanish period beginnings to become the premier town of Agusan del Norte. Its rich cultural heritage is evident in its preserved colonial period houses and its archaeological collections. On August 16, 2000, the seat of provincial government was transferred from Butuan to Cabadbaran through Republic Act 8811, although the provincial government still holds office in Butuan City, pending the actual transfer of provincial offices to the new capital. Cabadbaran was officially declared a city in 2007. Cabadbaran lies 9 degrees north latitude and 125 degrees and 30 minutes east longitude in the northeastern part of Mindanao. Its boundaries are Tubay and Santiago to the north, Butuan Bay to the west, Magallanes and R. T. Romualdez to the south, and Sibagat, Agusan del Sur to the east. It is 29 kilometres (18 mi) from Butuan. It is generally flat with rolling hills and swamplands in its western part. The highest of all mountains in the Caraga region, Mount Hilong-Hilong (with an altitude of 2,012 metres (6,601 ft) above sea level), rises in this city. Cabadbaran is politically subdivided into 31 barangays. The city belongs to the Second Climatic Type of the Corona Classification. No definite dry season in the place and maximum rainfall occurs from October to January. The average rainfall is 171.29 millimetres (6.744 in) per month, average annual temperature 28 °C (82 °F). Traces of 12th century villages can be found near the waterways that pass through the territory of Cabadbaran. No records are found before the Spanish colonization except for a site in Sanghan where Chinese ceramics from 15th to 16th century were found. Cabadbaran was first mentioned by the Spanish as a small village chosen by the Spanish authorities to be turned into a reduction called "La Reunion de Cabarbaran" in 1867. The reduction was mostly populated by people from Southern Agusan. Then in 1879, the reduction was disbanded. The inhabitants of the reduction went back to their places of origin while the remaining migrated to Tubay. In 1880-1881, the reduction was revived by Father Saturnino Urios, but was named Tolosa to honor Father Urios' hometown in Spain. In 1880, Tolosa was headed by the Teniente del Barrio Don Eduardo Curato. He petitioned to the Spanish authorities for the township application of Tolosa to be approved. In January 31, 1894, the petition was approved. The population and the economy grew, which was driven by agriculture and commerce. But the growth suddenly came to a halt when the revolution against Spain started. No significant turmoil affected the city until the coming of the American forces in 1901. When the Americans arrived, Spanish forces were forced to surrender. Included with them was Capt. Andres Atega. Under the Americans, the town was called again as Cabadbaran (according to Don Andres Atega's proposal). In 1903, the public education system was established with George Bohner as the first American teacher. Public health also improved when Dr. Pedro Malbas was appointed as the Public Health Officer in the 1920s and constructed sanitary toilets, deep wells and drainage canals. Public infrastructure was also improved by the Americans. Then in the 1935 Constitutional Convention, Apolonio "Oyok" Curato, a lawyer, represented Agusan. He then became the Governor and Congressman of the province of Agusan. The local economy grew when it started producing abaca from coconut plantations established by the Americans. Rice was also grown and remained as staple crop grown in the fields up to this day. The Agusan-Surigao road opened in the 1930s and several bus lines started public service along this route. Cabadbaran had been occupied at one time by those resisting the Japanese occupation of Mindanao. Eventually the Japanese occupied it. On January 17, 1945, combined American and Filipino troops including recognized guerrillas fought a force of Japanese troops on the road between Cabadbaran and Butuan. The Japanese were in the process of reinforcing their garrison at Butuan. The guerrillas retreated when Japanese reinforcements arrived. The guerrillas also had depleted their ammunition. On March 31, 1945, Major Juan Rivera and a guerrilla detachment attacked the Japanese at Cabadbaran; the Japanese abandoned the post after an hour-long battle. The general headquarters of the Philippine Commonwealth Army and Philippine Constabulary was active on 1945 to 1946 in Cabadbaran during and aftermath of World War II. In November 2008, Cabadbaran and 15 other cities lost their cityhood after the Supreme Court of the Philippines granted a petition filed by the League of Cities of the Philippines, and declared unconstitutional the cityhood law (RA 9434) which had allowed the town to acquire its city status. The Supreme Court ruled that they did not pass the requirements for cityhood. Cabadbaran produces several agricultural crops such as rice, corn, coconut, abaca, banana, and mango. The city has the biggest area planted with coconuts in Agusan del Norte with 18.46% of the total land area planted with the crop. The Cabadbaran also has a booming economy based on agro industry, commerce and trade, source of several export and industrial products; it has also varied ecotourism destinations ranging from Caraga's highest peak, mile long tunnels to adventure tourism sites. Like the popular destinations situated on neighboring provinces, Cabadbaran experiences a growing ecotourism industry. Annual climbs to reach CARAGA's highest peak Mt. Hilong-Hilong (2,012 meters above sea level) has been organized by trekkers and mountaineers, there are also organized climbs to Mt. Mas-ai, a plateau located in Puting Bato which has a mountain top lake. Locals have also put up white water tubing adventures along Cabadbaran River including rappelling at some of the steep falls located at the foot of Mt. Hilong-hilong. Mt. Pongkay, which is a hill that can be seen from the city proper, can be a great destination for families who wants to experience the value of the Holy Week's penance and devotion. It is also a destination for mountain climbers and for those people who wants to see the panoramic view of Agusan del Norte and Butuan Bay. Cabadbaran also has cheap inland pools by local residents that is an alternative to inland resorts. Many of these pools have sprouted through the years because of Cabadbaran's abundant fresh water which the city is known for. The city is also a beach destination for people from neighboring municipalities because of its crystal clear water and gray sandy beaches. The city has multiple hotels as well like Loreta's, Gazebo, and Casa Alburo. Although Cabadbaran does not yet have any mainstream fast food restaurants, the city has various restaurants that offers Filipino, Japanese, and Chinese cuisine, an alternative to people who wants to have their fine dining locally than in the neighboring Butuan City. Musikainan Food and Music Festival - It is a celebrational tribute to the city's "culture and history as well as the local's cooking tradition". The entirety of Cabadbaran speaks Cebuano. There are also significant number of people who speak Surigaonon, for these people have lived or have ancestries from the northern municipalities and speak in a variety of the Jabonganon, Mainitnon and Gigaquitnon dialects of the Surigaonon language. Hiligaynon, Waray, Manobo languages, Butuanon, Boholano dialect, and Maranao have also less significant speakers in the area while English and Filipino are also widely used spoken. After the Provincial Government of Agusan del Norte attain the reclassification of their land conducted by the Dept. of Agriculture (DA) in Brgy. Sanghan, Cabadbaran City where the new Capitol building will be constructed, the land conversion by the Department of Agrarian Reform (DAR) will soon follow. It will feature a modern design, including an employees village at the back of the new building intended for the provincial employees. The list of mayors that took office in Cabadbaran starting in 1896. Cabadbaran city is accessible by bus from Bachelor Express or Surigao Bus via Butuan-Surigao routes or vice versa. There are also vans, jeep and multi-cabs that have routes towards both Surigao City and Butuan City which are stationed in the City Transport Terminal. Candelaria Institute of Technology of Cabadbaran Inc.
^ "Republic Act No. 8811; An Act Transferring the Capital and Seat of Government of the Province of Agusan del Norte from Butuan City to the Municipality of Cabadbaran, Agusan del Norte" (PDF). Congress of the Philippines (official website). Archived from the original (PDF) on 3 March 2016. Retrieved 4 December 2015. ^ a b "History of Cabadbaran". www.cabadbaranadn.gov.ph. Retrieved 2016-06-10. ^ Virginia Hansen Holmes, Guerrilla Daughter (Kent, Ohio: Kent State U. Press, 2009), p. 73. ^ Kent Holmes, Wendell Fertig and His Guerrilla Forces in the Philippines: Fighting the Japanese Occupation, 1942-1945 (Jefferson, N.C.: McFarland & Co., 2015), pp. 116-7. ^ Kent Holmes, p. 119. ^ "Cabadbaran Mayors". cabadbaranadn.gov.ph. Archived from the original on 2014-12-27. Retrieved 2016-06-10. Wikimedia Commons has media related to Cabadbaran City.